The BBC has already explained its intention to provide coverage of certain flagship events in 3D, but now Panasonic (the official worldwide partner for the Games in terms of AV) says the opening and closing ceremonies, plus athletics, swimming, gymnastics and diving events will also be covered in 3D. Panasonic is partnering with Olympic Broadcasting Services (the host broadcaster) as well as the IOC in order to generate the world’s first-ever 3D in HD transmissions. 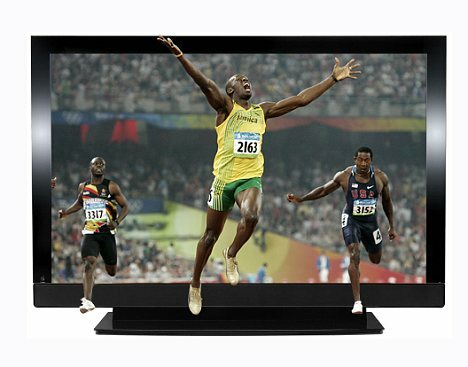 “OBS will be in charge of producing more than 200 hours of 3D coverage during the London 2012 Olympic Games by utilizing Panasonic’s state-of-the-art 3D production technologies including the AG-3DP1, a P2HD professional fully-integrated twin-lens Full HD 3D camera recorder,” says a Panasonic statement. “The Olympic Games has always been a pioneer in the development of TV broadcasting technologies, and has been on the cusp of innovation since the first live over-the-air broadcast was introduced in London 1948. Panasonic has been proud to support the Olympic Host Broadcaster since the first digital broadcast in Barcelona 1992, right through to the first HD broadcast in Beijing 2008. Now we are proud to announce the partnership with the IOC and OBS to create another successful era in Olympic broadcasting with the first live 3D Olympic Games at London 2012. There is no doubt that the Olympic Games will provide some of the best content for the 3D market in the future, and that 3D TV will drastically change the way we experience this great sporting event in our living rooms,” said Takumi Kajisha, Managing Executive Officer of Panasonic.